Portugal got its name from the city of Porto, which sprawls across the hills that rise above the valley of the Douro river. The graceful bridges that arc across the river are amongst the most prominent features of the city. The best vantage point from which to admire them is a table in one of the many cafes that line the waterfront. Sitting in the shade of a cafe umbrella gives you lots of time to savour the port wine that the city is famous for. Wine warehouses are still located along the riverside, many bearing the names of English merchants such as Cockburn, Graham and Sandeman, who once controlled the port trade. In front of them are moored rabelos, traditional boats that used to pick up wine from the vineyards along the Douro valley and bring them to the warehouses for bottling. Aside from port, another great contribution made by the Portuguese to world cuisine was potatoes. Potatoes were one of the great discoveries that Portuguese explorers made when they arrived in South America in the early sixteenth century, for they were unknown in the rest of the world at that time. The Portuguese carried potatoes to their colonies in Goa, from where their popularity spread across India. Today, trying to imagine what Indian cuisine would be like without potatoes is almost impossible. The meals we ate in Portuguese cafes almost always included potatoes. Sometimes they were simply boiled, other times they were served as French fries or folded into the dish at the very end. 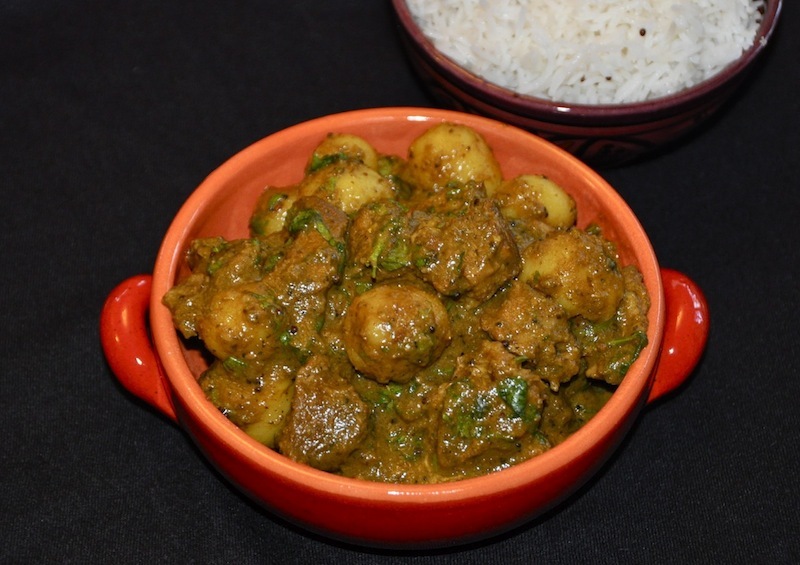 Potatoes are an integral component of my recipe for Lamb Vindaloo as well and my favourite part of this dish. They absorb the sauce as they cook and become melt in the mouth flavourful! Vindaloo is further evidence of Portuguese influence on Indian cuisine. The name itself is a combination of the Portuguese words vinho, wine vinegar, and alhos, garlic. Wine vinegar is unknown in traditional Indian cuisine, but was widely available in Europe, where wine stored in wooden barrels fermented rapidly and turned into vinegar in a few months. Goan cooks blended Indian and Portuguese cooking traditions to come up with this wonderful dish. If you wish to serve a complete Goan meal, prepare Chicken Samosas and Goan Grilled Fish along with this dish. You can also easily make chicken or pork vindaloo by substituting them for the lamb. And if you are vegetarian, try making it just with potatoes. Now that's delicious! Warm 2 tbsp oil in deep non stick skillet set over medium high heat. Add onions, garlic, ginger and chilies. Saute for about 5 min until they are lightly browned. Transfer to jar of mini blender or food processor and add vinegar, red wine, salt and all the ground spices. Process until smooth. Place lamb in mixing bowl and transfer spice paste on to lamb. Mix well, cover and refrigerate overnight if possible. Warm remaining 1 tbsp oil in deep non stick skillet. Add mustard and cumin seeds. After 30 sec, add lamb and all its marinade. Saute for 2 min then add 1/2 cup water. Cover skillet and let mixture start bubbling. Reduce heat to low and cook lamb for 1 hour, stirring occasionally. Add potatoes to lamb in skillet, mixing gently. Cook for another 1/2 hour or until lamb and potatoes are very tender. Fold in fresh coriander.